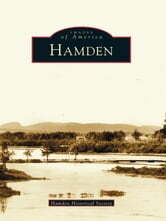 Hamden is nicknamed "the Land of the Sleeping Giant" after the series of hills within its bounds that resemble a recumbent giant. But Hamden is much more than the resting place of the legendary "Hobbomock." The town's history is illustrated here in Hamden, which contains photographs dating from the 1840s through the late 1900s. These vintage images depict the contours of community life in Hamden. The collection highlights famous residents, including Eli Whitney and Thornton Wilder; local eccentrics, including the wandering Leatherman and William Beamish, a female printer who lived as a man; changes in the land from forest to farmland to suburbia; businesses, institutions, civic organizations, and churches; and people at play-from skaters on Lake Whitney to hikers on the Sleeping Giant.